I am having a two main issues here beginning after I moved game on macOS X Mojave. Initially I used a Windows XP as a guest in Parallels Desktop on my macOS X Mavericks and its was run well (openxcom_git_master_2018_12), then decide install a native port after updating to macOS X Mojave on it (openxcom_git_master_2019_02_04_1901). As result it was installed and running well as it is, but I having issues and basically playing with some settings and reading a manual is not help me to understand what to do to resolve. it is happen on AUTOBATTLESCAPE SAVE and QUICKSAVE, GLOBE SAVE is possible to load successfully. but when loading a game through clicking an OpenXcom.App it is still looking user config files in $HOME/Library/Application Support/OpenXcom and creating that folder and files in it if it is removed. #~/Games/openxcom/openxcom.app/Contents/MacOS/openxcom -data "$XDG_DATA_DIRS/openxcom" -user "$XDG_DATA_HOME/openxcom" -config "$XDG_CONFIG_HOME/openxcom"
[09-02-2019_19-40-09]	[INFO]	Options loaded successfully. [09-02-2019_19-40-09]	[INFO]	SDL initialized successfully. [09-02-2019_19-40-10]	[INFO]	SDL_mixer initialized successfully. [09-02-2019_19-40-11]	[INFO]	Display set to 1280x800x8. [09-02-2019_19-40-11]	[INFO]	Resources files mapped successfully. [09-02-2019_19-40-15]	[INFO]	Data loaded successfully. [09-02-2019_19-40-15]	[INFO]	Language loaded successfully. [09-02-2019_19-40-15]	[INFO]	OpenXcom started successfully! [09-02-2019_19-40-15]	[INFO]	Using software scaling routine. For best results, try an OpenGL filter. [09-02-2019_19-40-31]	[INFO]	Resources files mapped successfully. [09-02-2019_19-40-31]	[INFO]	Display set to 1280x800x8. [09-02-2019_19-40-31]	[INFO]	SDL_mixer initialized successfully. [09-02-2019_19-40-35]	[INFO]	Data loaded successfully. [09-02-2019_19-40-35]	[INFO]	Language loaded successfully. [09-02-2019_19-40-35]	[INFO]	OpenXcom started successfully! [09-02-2019_19-58-56]	[INFO]	Options loaded successfully. [09-02-2019_19-58-56]	[INFO]	SDL initialized successfully. [09-02-2019_19-58-56]	[INFO]	SDL_mixer initialized successfully. [09-02-2019_19-58-56]	[INFO]	Display set to 640x400x8. [09-02-2019_19-58-57]	[INFO]	Resources files mapped successfully. [09-02-2019_19-59-00]	[INFO]	Data loaded successfully. [09-02-2019_19-59-00]	[INFO]	Language loaded successfully. [09-02-2019_19-59-00]	[INFO]	OpenXcom started successfully! [09-02-2019_19-59-00]	[INFO]	Using software scaling routine. For best results, try an OpenGL filter. Not sure how it works on macOS, but normally bash does not expand the tilde when assigned to a variable. Be warned though, many more applications pickup those XDG_* directories so your approach will probably give some weird results with other software. May i ask why you do not want to use the default location under ~/.local/share ? Logs show that the tilda was expanded all right, that's not the problem. re I - Battlescape saves are not guaranteed to load on a different version, although the exact error looks unfamiliar. This only means they are not set globally enough. As in the .app does not see them. I'm no expert on OSX and no hardware to test it is nearby. I doubt it's in any way yaml-cpp's fault. Post the save in question here if you don't mind. That one, right? 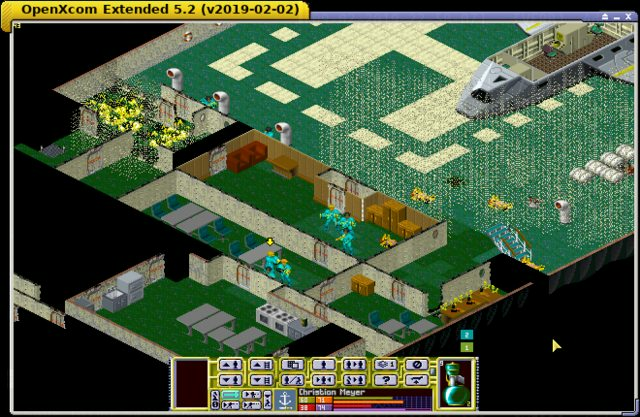 No problems loading, though that's some random OpenXcom Extended version I had around at the moment. You can maybe try running it, without extra mods it's indistinguishable from non-Extended. That's what I meant, those vars are global for the shell all right, but do not reach the .app which runs in some other environment likely. Here I can't help you. Also please check what our version of yaml-lib is just to be sure. It is MacOs, sorry no pity from me for Apple Users. You brought this pain too yourself. The savegame file loads for me fine under Linux, using the latest nightly version from github. There is no need to be harsh on users that prefer different operating systems. Problem here is that this community does not have that many macOS developers making it harder to solve these kind of problems. Besides that, it does not help that Apple has changed the behavior for GUI application starters and the way to influence these variables quite a lot over the past few releases (judging from the amount of internet topics/posts). From what i understand the current situation is that each app is sandboxed and there is no easy way to set per user login variables. 1. Edit the contents of the app itself (plist perhaps?) so that its calling parameters point to your preferred "/Users/user/Games/openxcom/" folder. - This can be painful since you probably have to do it on each update of the app. 2. Create a symbolic link so that "/Users/Shared/OpenXcom/" points to "/Users/user/Games/openxcom/". Note: I am a linux user myself, so take any advice with a big grain of salt. Yeah, true. Without dedicated apple hardware those builds are shots in the dark - no way to test, no way to troubleshoot, no nothing. Installing a VirtualBox image is not the real thing. And a second-hand real thing costs upwards of $500, so .. unless someone comes up with hardware (able to run Mojave) or cash, that's where it stays. At "We are glad it even runs". So, that's why there are build for macOS X making not so often as a normal one for Windows versions? It is consist of course with original vanilla data files of the games. And am I right that it is not welcome to put links here on forum for torrent files consist of original game versions? or allowed to? I make a .dmg of OpenXcom Extended for OSX at least once a month.